Verona Series trash receptacles are eye-catching and distinctive. 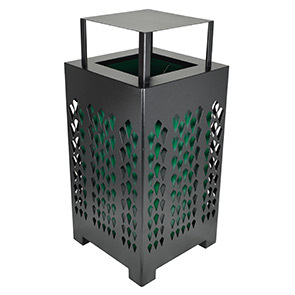 These 32 gallon all-steel trash receptacles are uniquely designed with a laser cut tapering diamond pattern base highlighted by the green steel liner and topped with a rain bonnet flat top lid. 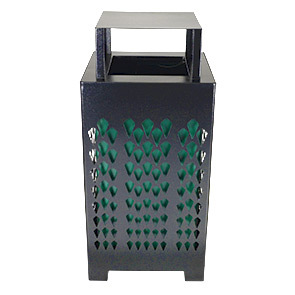 The unique lid provides an adequate opening for proper disposal, prevents the pooling of precipitation and comes standard with an attached security cable connecting to the base. A highly-durable, corrosion resistant powder-coated finish is applied for a protective seal against environmental conditions—ensuring a long lasting performance indoors or outdoors. ►Need a Trash Receptacle Fast? ► Items ship within 48 hours on orders up to 2 units.